As enshrined in our Corporate Values, we are devoted to building the communities where we work. Our commitment to building the communities where we draw our lifeblood is reflected in our comprehensive community relations programs, by identifying “gaps” or what these communities lack in terms of their physical, mental, social, health, and spiritual needs, and endeavour to help fill these gaps. In the process, we hope to improve the well-being of these communities. On a national scale, we actively participate in the advocacies and societal development activities of our industry group. Effective communication is vital in building communities. The Barangay Hall of Old Macopa was in dire need of a public address sound system for the conduct of community functions, meetings and other vital activities. To address this need, and in response to Barangay Old Macopa's specific request from TMEC for a public address sound system for use during barangay activities, TMEC donated on June 2nd 2014 a high fidelity sound system. 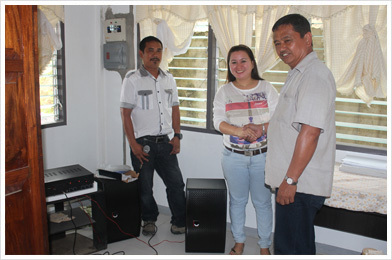 Shown accepting the audio equipment is Ms. Robelyn A. Macadagat, Barangay Chairman (2nd from left), during turnover ceremonies held at the Barangay Hall. As part of Titan Mining and Energy Corporation's Corporate and Social Responsibility (CSR) Programme, the company surveyed the local community to determine what it can contribute and found a dilapidated church in the town of Little Baguio located in the Municipality of Kabasalan, Zamboanga Sibugay. Titan Mining and Energy Corporation stepped forward and initiated contact with the parish priest. 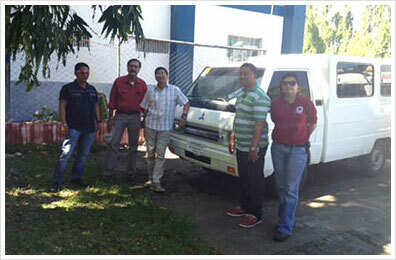 Since then, the company has worked with both the local community parish and barangay (town) officials to provide materials and manpower for the construction of the Viva Senor San Jose Church which will serve as a renewed venue for worship and spiritual gathering for the Catholic families that reside within the area. In another initiative under the company's Corporate Social Responsibility (CSR) Programme, Titan Mining and Energy Corporation got together with Christ the King Greenmeadows Foundation, Inc. (CTKGFI) and Gawad Kalinga (GK) for the construction of homes and the re-location of some 58 families to Brgy. Kaligayahan, Novaliches, Quezon City. The beneficiaries of this project are the informal settlers who lived directly under the C5 Flyover and were directly affected by the expansion of the C-5 Road in Libis, Quezon City. To become eligible for re-location, the residents needed to undergo extensive training and orientation on values formation and community-building. Titan Mining and Energy Corporation and CTKGFI committed to sponsor the project which was completed in November 2009.